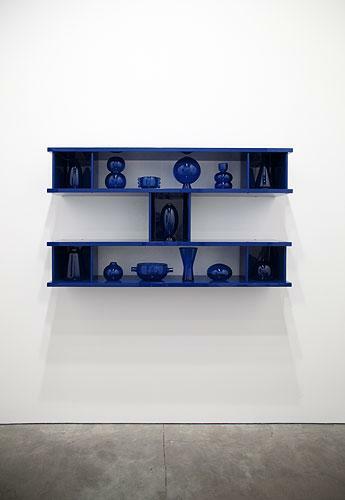 We are happy to present a three-person project in Gallery 3 with an informal title: Blue Design. 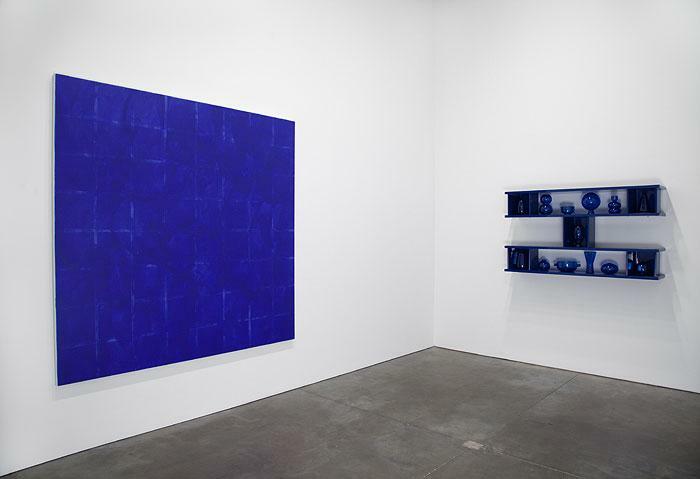 Consisting of three works, each in a similar blue tonality, the project features a new sculptural work by Josiah McElheny, a painting on canvas by Heimo Zobernig and a wall painting by Blinky Palermo. The artworks are related through their use of the language of architecture and design as a way to demonstrate that color is a narrative element of abstraction. 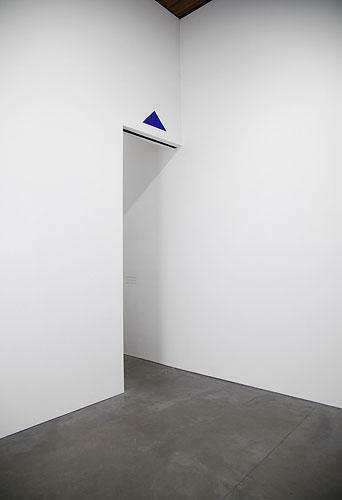 Blaues Dreieck (Blue Triangle) from 1969 utilizes Palermo's signature triangle form that appears in a number of his works. In this case, it becomes an instructional/conceptual work in which anyone can stencil the painting onto any wall, but only over a doorway in a precise relationship to that particular doorway. It speaks to one of Palermo's important critiques of abstraction, namely that the situation or site that a work of art inhabits cannot be ignored, that this "story" forms an important element of the content of abstraction. Untitled, Zobernig's painting from 2008, continues his analysis of modernist abstraction through the lens of design. Although painting forms only a part of his expansive oeuvre, his use of high-key color connects him to what has been called Palermo's "color radicalism." In this work Zobernig delineates space much as a graphic designer might, though then he obscures this structure in a field of uneven blue. As Joshua Decter wrote in Artforum around the time of this painting: "Since the 1980's, Zobernig has coolly unpacked modernism as a formal language and as social ideology, reminding us that design (gallery architecture included) is never neutral." In Charlotte Perriand (and Carlos Scarpa), Blue from 2010, McElheny continues his exploration of the confluence of abstraction with the social history of design and architecture. 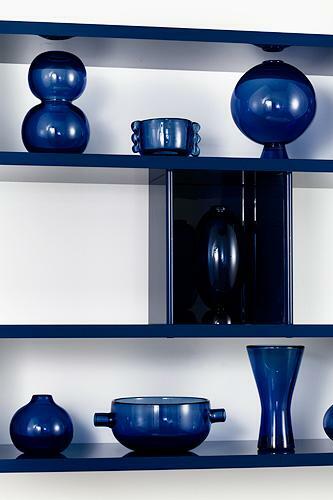 A shelving design by Charlotte Perriand is remade in a deep glossy blue and inhabited by designs by Carlos Scarpa that have been reconstructed in radiant blue glass. Connected to Palermo's exploration of material itself as a narrative element in abstraction in his Stoffbilder or Cloth Pictures, in this case the reflective and translucent materials form not a monochrome, but a sculpture made of innumerable color shifts. With this project we would also like to announce McElheny's upcoming project at the Bard CCS Hessel Museum in the summer of 2011. The project will coincide with the Blinky Palermo retrospective at Bard. In dialogue with the Palermo exhibition on the other side of the museum, it will involve McElheny curating and intervening in the display of the permanent collection.